Phang Nga Elephant Park is a small family-run Park. Our family has cared for elephants for over 150 years, with each generation learning something new about the Asian elephant and their welfare. The Park is like a typical small, rural Thai village, where thirty people live and work together with their elephants and families. Animal welfare is paramount at Phang Nga Elephant Park. 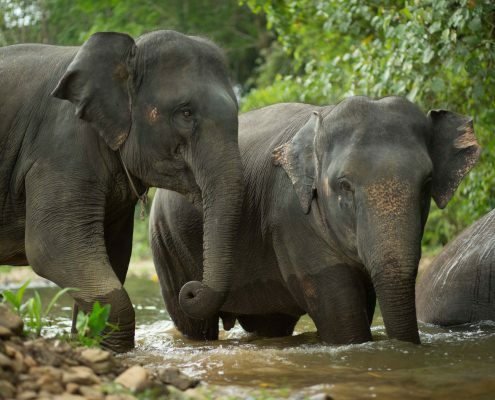 We consider that responsible and ethical elephant tourism will help to save the Asian elephant, but requires the highest level of care and husbandry. We are AGAINST unnatural and abusive practices and strive constantly to improve animal welfare and to promote education. For more information please check out our Education Centre. We are determined to provide our elephants with the highest quality of life possible and our strong belief in human-elephant interaction is what makes Phang Nga Elephant Park so special. Our visitors are able to have a life-enhancing experience with these magnificent animals and learn about them in a natural and relaxed environment. It was a very intimate experience that gave us an understanding of the bond between an elephant and his mahout (handler). If you are looking for an experience that goes a bit deeper than the typical tour then this is a must. My best friend and I love elephants so this was our fourth elephant experience around the world. Nothing as come close to Phang Nga Elephant Park! It warmed our hearts to see the elephants treated like family. 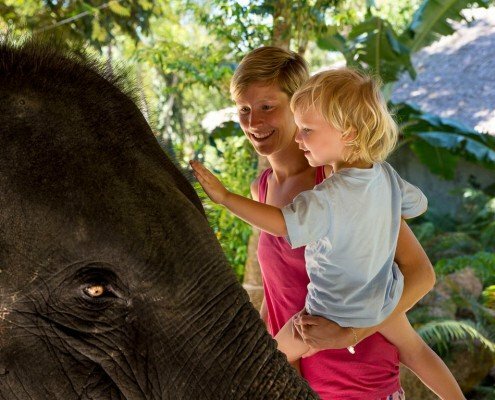 Phang Nga Elephant Park is outstanding in their ethical treatment of the elephants and offers a rare and informative experience. An experience that really allows the individual to get to know the elephants. The Thai cooking lesson is also very enjoyable and the food that we prepared was delicious. Absolutely beautiful set up and big thumbs up from a vet nurse with regards to welfare. Everyone at the park gets top marks for making my family and I feel welcome. This was an unforgettable day! The elephants are clearly at home and well cared for. It was lovely plodding along on these huge and beautiful creatures at butterfly level through the trees. We got to experience firsthand what being a mahout (handler) would be like. You get to wash them, feed them, play with them, ride them bare back and cook amazing Thai food. The best four hours of wildlife interaction I have ever had. We had as much time as we wanted to feed, walk, groom, adore and even swim with the elephants. The day I spent at Phang Nga Elephant Park has been the highlight of my holiday to Thailand. They care deeply about the health and well being of these magnificent creatures. Had a superb family day with the elephants! The kids can’t stop talking about it. Highly recommend for anyone interested in visiting elephants in an environment that values animal welfare! Phang Nga Elephant Park Co. Ltd.